Overall it was a very well organized event. Through out the race the road was closed, so we have the road to ourselves. No cars from the back or from the front disturbing the race, so it was very much safe. 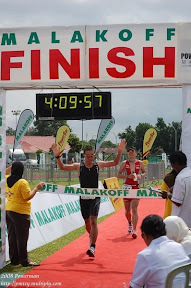 What I like about this race was that it was held outside Miri in a small town, organize by a group of people and the best thing about it, they used a transponder for every bike to track the finishing time (in running, it is called timing chips). For that I really really respect them. Salute to you guys. Wouldn’t it be best if it is being used in Brunei. No more waiting for 3 hours for the results. Well I can dream and hope it will come true someday.